2.5 stars.Review originally posted at Book Probe Reviews.If any book has “Hotter than the Hunger Games” on the cover or something similar – I WILL NOT FALL FOR IT! Well, to be honest, I didn’t fall for it. When I was sent a copy for review last year it had an intriguing ring to it with the criminal children being sent to an island in the middle of no where for testing, and also that it sounded like an amalgamation of dystopia and sci-fi books I’ve read before like The Hunger Games (yes, I hear you) and The Maze Runner, and even the TV show LOST. 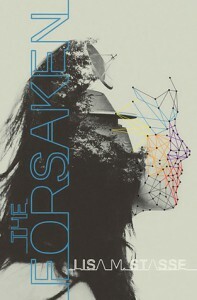 For sure, The Forsaken is pale in comparison, a book so calculated it’s hard to like any characters, as well as anything that even happens.So why did I read it? Because I had The Uprising, the sequel, for review. If it wasn’t for the final chapters of The Forsaken I think I would have let this fish (series) back into the sea and caught another fish that would be more worth it and tries less at forcing me to like it.Alenna Shawcross is at one moment being tested for abnormalities and then the next waking up on an island, with no idea why she was dropped into this Island of Terror, called by the inhabitants of the island, the villagers and the drones, as ‘the wheel’. The villagers and the drones are at war with one another, the drones lead by a Monk who is sick and infested, trying to taken control of the sectors of the wheel they have yet to capture, particularly the sector the villagers inhabit. Then there’s the grey zone, a dead zone, where anyone is killed if they attempt to cross. Why am I even explaining this story? It took so long to get to the good parts, the “revelations”, the surprises, that I nearly fell asleep and skimmed through 200 pages just to encounter something that’s interesting.In part, that was probably because the writing was very average. Very monotone and unexciting. It was very ‘meh!’. What also didn’t click with me was the romance. It was extremely contrived considering they’re on an island – trying to SURVIVE everything that is attacking them. This goes hand in hand with the way too calculated plot. If Alenna became good friends with Liam, almost as brother and sister feelings, if Liam would do anything to protect Alenna and vice versa, then that would have been more interesting to read about. The romance was The Forsaken‘s biggest failure.As I said previously, I did enjoy the final chapters considering WHERE they got and WHY things were like what they were on the island, as well as WHY the UNA is sending these people to the island (this is why it’s 3 stars and not 2.5 stars uhhh, nope, it’s back to 2.5 after some thinking, and not 2 stars). It gave me hope that the sequel may just be a lot better……and The Uprising hasn’t really lived up to my expectations yet. We’ll see.